Matt Makes Games’ Towerfall Ascension is a combat platformer for up to four players, heavily centered on local multiplayer. The primary play mode of the game has two to four players battle it out on multi-level stage using bows and arrows in a fast-paced, last man standing play mode. 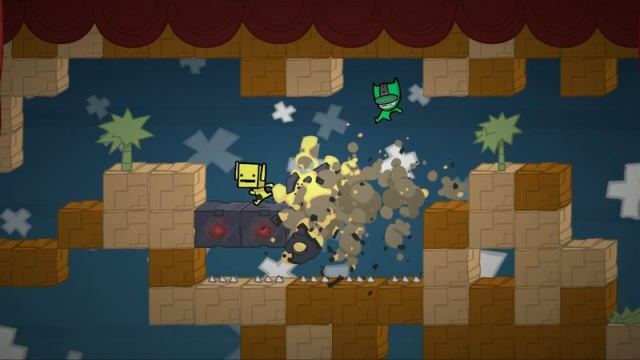 The secondary play mode is a cooperative feature for one to four players, in which a variety of monsters spawn and force the players to work together to slay the enemies, all the while maintaining careful accuracy not to murder each other. 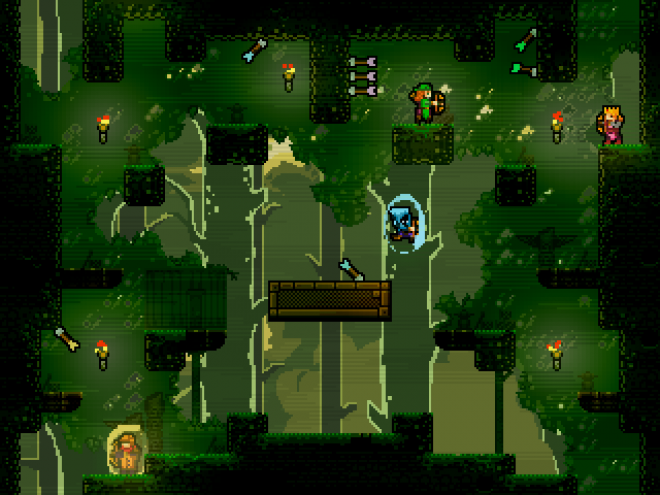 Taken at face value, Towerfall Ascension may seem simplistic. After a few minutes of gameplay with your friends, however, you’ll find the beauty hidden just below the surface of the game: social interaction. Duking it out in the same room as your friends is something that has been phased out of almost every modern video game, as they rely solely on the internet to connect you with the outside world. As we played through level after level, my friends and I enjoyed each other’s reactions just as much as the pixelated warfare on the screen. The common consensus is this: call some friends, order a pizza, and pick up Towerfall Ascension. You’ll thank me later. Fun for everyone – Let’s face it: everyone who plays video games is on a different level of experience than the next person, taken on a game by game, genre by genre basis. 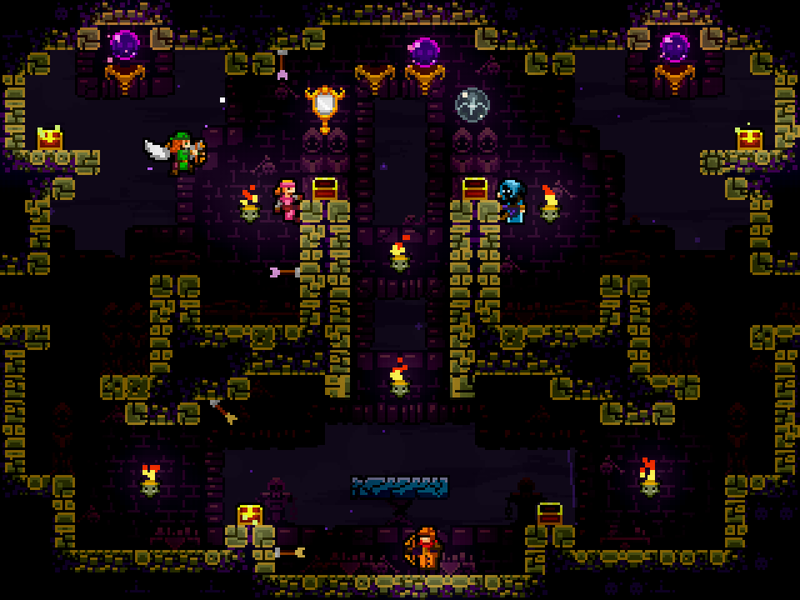 Towerfall Ascension, however, has a low barrier to entry to start playing (the controls consist of A, X, and RT) but leaves plenty of room to master the game after many hours of play. From your eight-year-old cousin to your spouse to anyone who can hold an Xbox One controller, everyone can and will have a great time playing Towerfall Ascension. Creative gameplay and results – Amidst the flurry of arrows, head-stomps and laughter, I found myself admiring the smaller aspects of the game that supplement the chaos. Each player has a very limited number of arrows, usually three or four to start the match. Retrieving your arrows is just as important to winning the game as firing them. Timing your jumps to catch ledges, as well as finding the perfect distance to hit the long shots on your foes plays a vital part in your success. At the end of each match, you’ll be shown statistics and titles of each player, like “Most Prepared,” “Most Trigger-happy,” and “Eagle Eye,” just to name a few. 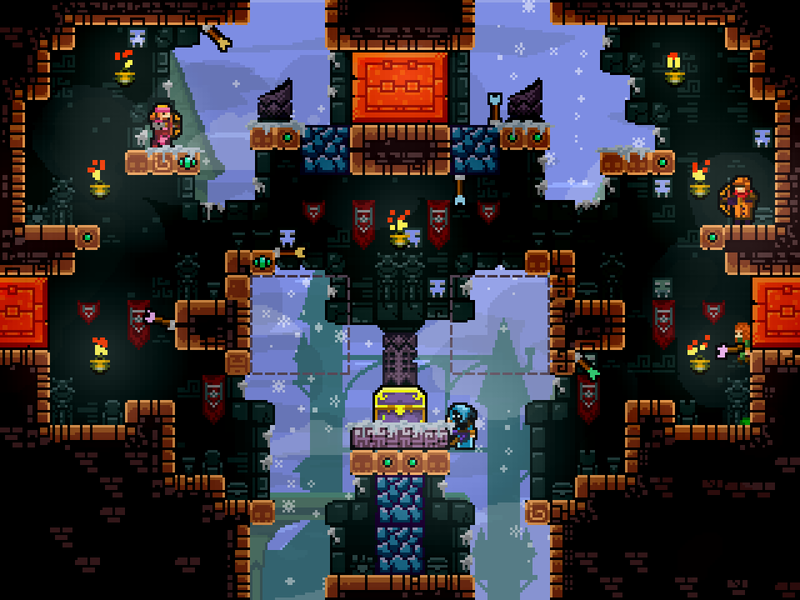 Chests filled with upgrades, character and monster animations and the build of each level all were icing on the cake. Couch parties aren’t dead – Remember when video games were a social thing? The late nights with your friends, the multiple controllers, the pizza and the memories were all a part of the evolution of gaming. It feels like this was something missing on Xbox One. It was refreshing to kick back and have someone else in the room to talk to, not just over a headset or voice channel. Towerfall Ascension helped me realized that more gaming with my friends all together is something we all wanted. 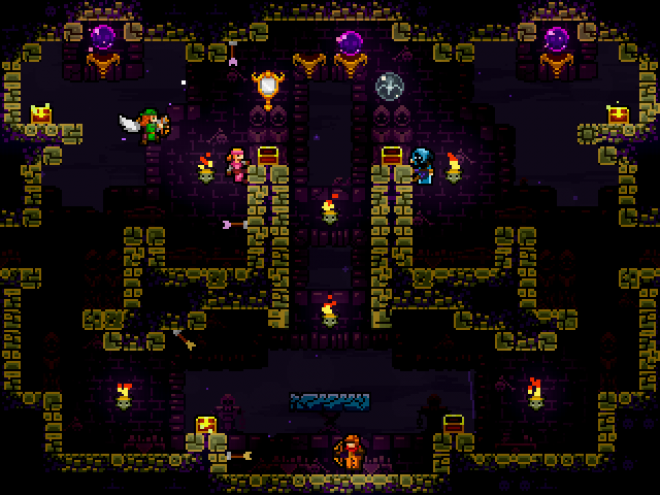 Can’t go it alone – The main drawback of Towerfall Ascension is a lack of single player capability. I didn’t mind it as much, as I played with three other people. However, had I not done the research on this game and purchased it thinking I could play by every mode alone, I would be bummed. 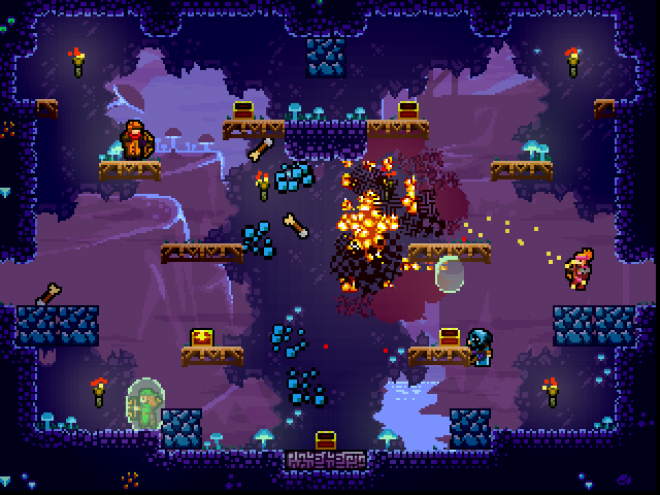 Towerfall Ascension can be played in single player mode against the environment, but certainly feels like something is missing. After a few levels, I found it getting extremely challenging, and could feel that the cooperative mode was indeed made for multiplayer, not single player. Compared to the gameplay with friends, the single player didn’t add up for me on Towerfall Ascension. While the community has been asking for online multiplayer since Towerfall Ascension released on other platforms in 2014, it doesn’t look like that will be an addition anytime soon. Modern day bias – The colors and sounds of the game are super retro. This review is your fair warning. If you despise pixelated characters, arcade soundtracks and old-school sound effects, then stay away from Towerfall Ascension. This game pays homage to classic gaming in a large way. This game is completely two-dimensional, with a small amount of variation in playstyle and map generation. If you’re still on the fence at this point about Towerfall Ascension, I haven’t done my job well enough. Call a few friends to come over, catch up, order some pizza, grab some controllers, and pool some money together if you can’t afford the 14.99 price. You’re in for a treat. Towerfall Ascension was developed by Matt Thorson and published by Matt Makes Games, Inc. It was released for Xbox One on January 24th, 2017. A copy was provided for review purposes.